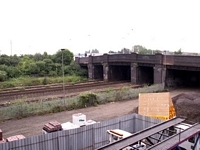 Bromford Bridge station opened in 1896 primarily to serve the Birmingham Racecourse that had opened nearby in 1865 with 'Race Day Specials' under the Midland Railway and, as such, operated only on race days. In the above photograph, we see the station in 1962 looking towards Water Orton from Bromford Lane bridge as a goods working thunders through: not the signal box on the Birmingham platform (photo: B.Brooksbank). The station closed following the decision to close the Racecourse in 1965. In order to explore the site of Bromford Bride station, I required three visits: one on which I couldn't find anywhere to park, a second on which I got in position to take my first shot and then realised I had no memory card in the camera and then, third-time lucky! 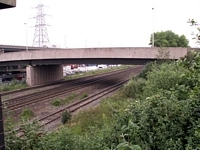 Bromford Lane at Bromford Bridge now consists of a large traffic island raised above the railway and under the M6. Above-left we are standing on the new 'Bromford Bridge' part of the traffic island, looking across at the original Bromford Bridge at what would have been the rear of the station building from where the stairways to track level would have descended. 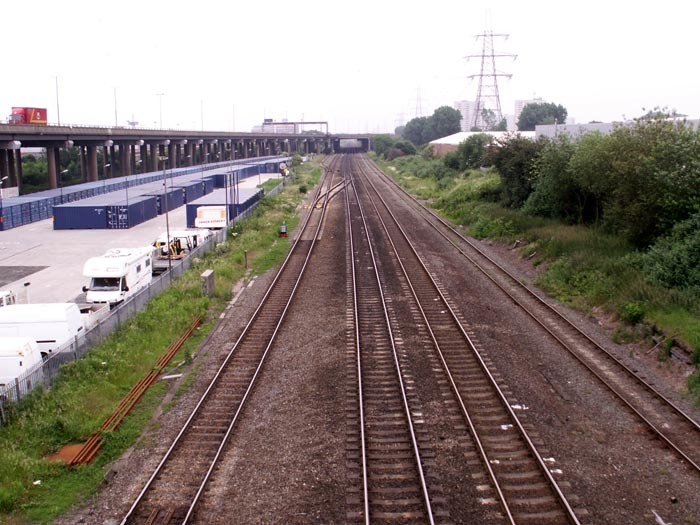 Above-right we have walked around to stand on the original Bromford Bridge and look at the station site - the vantage pint for the previous photograph ahead - as we look towards Water Orton. 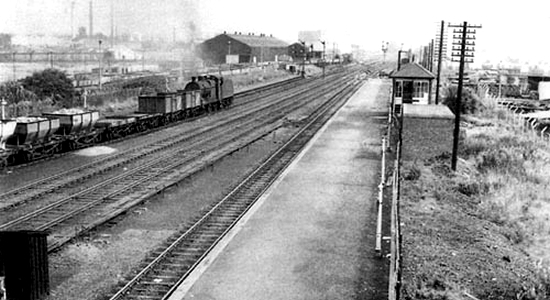 The signal box seen in the 1962 photograph stood roughly where the bridge ahead can bee seen, to the right. Above-left we are in the same spot as for the previous shot but this time looking towards Birmingham with the slip-road for the M6 curving upwards over the track. Not immediately discernible on the small photo above (click on it to open a larger version) are sidings ahead to the right occupied by a class 08 diesel shunter and assorted wagons. 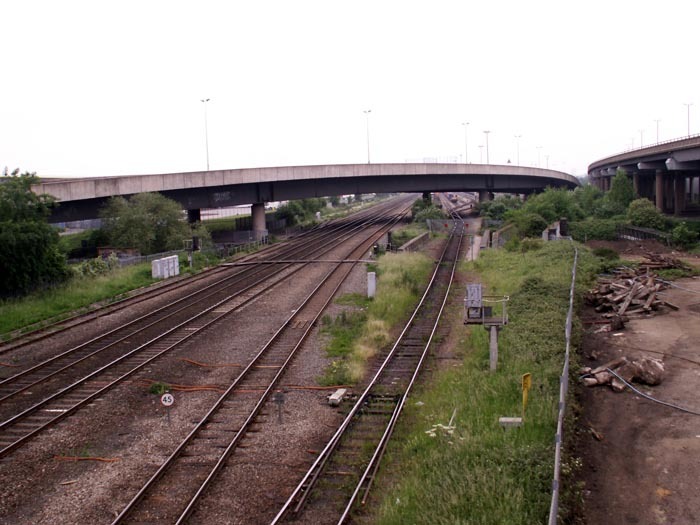 Above-right is the closest we can get to recreating the 1962 shot, looking in the direction of Water Orton from the 'new' Bromford Lane bridge.